^ 西郷 2003, p. 51. ^ a b Dietrich 1975, pp. 166,167. ^ Burkert 1985, p. 285. ^ a b c d エリアーデ 1991, p. 177. ^ a b c 片山 1985, p. 237. ^ a b 白石 2000, pp. 40-41. ^ Dietrich 1975, pp. 16-21. ^ エリアーデ 1991, p. 046. ^ エリアーデ 1991, p. 042. ^ 安村 1994, pp. 40-41. ^ 片山 1985, p. 187. ^ Nilsson 1940, p. 470. ^ エリアーデ 1991, p. 186. ^ 山川 2009, p. 2-3. ^ 山川 2009, p. 18. ^ Schachermeyer 1967, p. 141. ^ 片山 1985, p. 19. ^ エリアーデ 1991, p. 044. ^ 高橋 1996, pp. 61-62. ^ アポロドーロス 1953, p. 166-167（3巻15・4-15・5）. ^ 高津 1960, pp. 63-64. ^ アポロドーロス 1953, p. 173（摘要1・3）. ^ 高津 1960, p. 123. ^ パウサニアス 1991, p. 77（1巻38・3）. ^ 高橋 1996, p. 51. ^ 白石 1999, p. 73. ^ 沼 & 1995-09, p. 59. ^ 桑山 2010, pp. 1-2. ^ a b Kloft 2010, p. 25. ^ パウサニアス 1991, p. 540（8巻25・5）. ^ a b 庄子2011, p. 76. ^ アポロドーロス 1953, p. 37（1巻5・2）. ^ 高津 1960, p. 175. ^ a b c 安村 1994, p. 32. ^ a b 福田 1982, p. 142. ^ 片山 1985, pp. 10-49. ^ ブルケルト 1985, p. 204. ^ フレイザー 1951, p. 139以下（44章）. ^ 西郷 2003, p. 53-54. ^ 片山 1985, p. 235. ^ 片山 1985, pp. 235-236. ^ 久木田 1995, pp. 20-21. ^ ブルケルト 1985, pp. 192,207. ^ 片山 1985, pp. 237-238. ^ a b 庄子 2011, p. 75. ^ a b 安村 1994, p. 42. ^ エリアーデ 1991, p. 175. ^ 沼 1995, p. 31. ^ 片山 1985, p. 194. ^ ケレーニイ 1974, p. 265. ^ 片山 1985, p. 48. ^ Gagné, Renaud (2009). 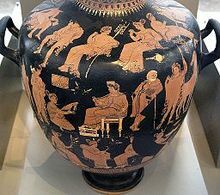 “Mystery Inquisitors: Performance, Authority, and Sacrilege at Eleusis” (英語). Classical Antiquity 28 (2): 211–247. doi:10.1525/CA.2009.28.2.211. ISSN 0278-6656. http://ca.ucpress.edu/content/28/2/211. ^ Filonik, Jakub (2013). “Athenian impiety trials: a reappraisal” (英語). Dike 16: 46–51. doi:10.13130/1128-8221/4290. ISSN 1128-8221. http://riviste.unimi.it/index.php/Dike/article/view/4290. ^ 秋山 1997, p. 18. ^ a b エリアーデ 1991, p. 178. ^ 安村 1994, p. 40. ^ エリアーデ 1991, pp. 180-184, 049. ^ a b 秋山 1997, p. 26. ^ a b Mylonas 1961, pp. 239,243. ^ 白石 1999, p. 81-82. ^ 高津 1960, p. 241. ^ 白石 2000, p. 8. ^ a b 西郷 2003, pp. 54-55. ^ 白石 2000, pp. 6-14. ^ 白石 2000, pp. 9-10. ^ エリアーデ 1991, p. 050. ^ 白石 2000, pp. 12-13. ^ エリアーデ 1991, p. 181. ^ Boardman, Griffin, and Murray 1986. ^ グレーヴス 1955, p. 81. ^ a b Wasson, Ruck, Hofmann 1978. ^ a b テレンス・マッケナ 2003, pp. 166-171. ^ Sansonese 1994, pp. 195-215. ^ 秋山 1997, pp. 30-31. ^ 久木田 1995, pp. 19-20. Boardman, Griffin, and Murray (1986). The Oxford History of the Classical World. Oxford University Press. ISBN 978-0-19-872112-3. Dietrich (1975). The origins of Greek Religion. Bristol Phoenix Press. Kloft, Hans (2010). Mysterienkulte der Antike. Götter, Menschen, Rituale. C. H. Beck. ISBN 978-3-406-44606-1. Metzner, Ralph (1997). The Reunification of the Sacred and the natural Eleusis Volume VIII. Mylonas, George Emmanuel (1961). 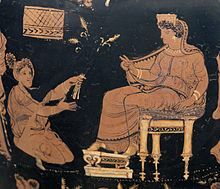 Eleusis and the Eleusinian Mysteries. Princeton University. Nilsson, Martin P (1940). Greek Popular Religion. http://www.sacred-texts.com/cla/gpr/. Sansonese, J. Nigro (1994). The Body of Myth.. Rochester, VT: Inner Traditions. ISBN 0-89281-409-8. Schachermeyer, F (1967). Die Minoische Kultur des alten Kreta. W. Kohlhammer Stuttgart. Shulgin, Alexander; Ann Shulgin (1997). TiHKAL. Transform Press. Smith, William (1875). A Dictionary of Greek and Roman Antiquities. London. Wasson, R, Ruck, C, Hofmann, A (1978). The Road to Eleusis: Unveiling the Secret of the Mysteries. Harcourt, Brace, Jovanovich. ISBN 0-15-177872-8. Images of Inscriptions about the Mysteries at Eleusis, en:Cornell University Library.